Ongoing Restoration Projects – It Never Ends! 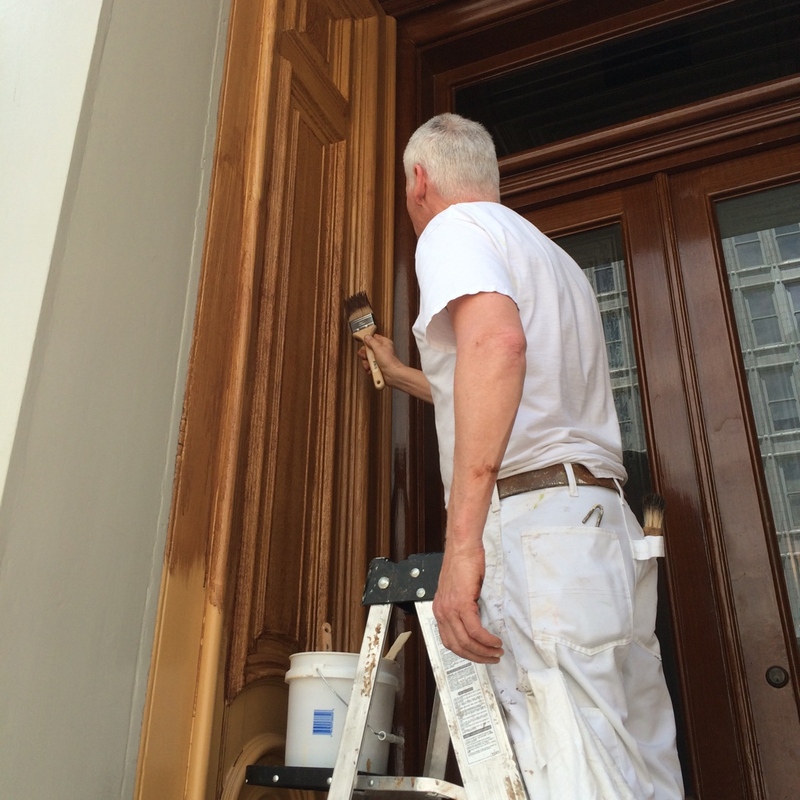 Painter Dave creates a wood grain design on the primed outer front doors. The magical mixture he uses for this is made from stale beer and Karo Syrup. The sugar content of both ingredients means the design is easy to manipulate and takes a long time to dry. If you’ve been to the Campbell House more than once, you know that something is different on every visit. Some new bit of history has been discovered or a new artifact is on display or maybe new window dressings have been put up. Last week, painters completed the finishing touches on two very special projects here at the Museum, both involving doors. Giant. Doors. The first project was our outer front doors. The substantial, 9 foot outer front doors provided the Campbells and their ornate smaller inner front doors a barrier between the house and the city street. They’ve been hanging on their hinges for 164 years and counting and have experienced a wide array of temperatures, precipitation, soot, smog and pretty much anything else you can imagine in their lifetimes. Ten years ago, as the Museum’s restoration came to a close, these doors were restored with a faux-grained wood finish. A decade later, they were beginning to show their age and the time had come to restore the restoration (anyone who has lived in an old house for any length of time will understand this). Carefully… carefully… those doors were heavy. The other project was even more exciting. A generous grant allowed us to tackle a restoration project that’s been on the back burner for years, decades really. The Campbells’ elegant double parlor has a set of pocket doors leading into it, designed to smoothly slide open and closed for a “grand reveal” of the gilded room and its contents. The thing is, they haven’t opened and closed very smoothly for about 70 years. In fact, they were jammed solidly open. The grant allowed us to hire some woodworking professionals to come in, remove a portion of the door frame and pull the doors off of their tracks. What they found was unexpected, but not surprising. The wheel mechanism in the bottom of the door still worked perfectly – the problem was that a century and half of dust and coal soot had built up inside the wall and piled at the bottom of the door’s enclosure, creating a solid heap which the door was riding up and jamming itself on. After removing the clog, oiling up the mechanics and replacing the doors on their tracks, they’re back to working as well as they did when Robert and Virginia bought the house back in 1854. The painters that worked on restoring our outer front doors then restored the pocket doors’ faux wood grain finish – and they look GREAT! Click below to see the “GRAND REVEAL” through the Parlor pocket doors and click through the gallery below to see the two projects happen from start to finish. Painter Dave applies a coat of primer. This will be the lightest tone of the spectrum of colors in the wood grain’s finished product. Outer front doors with wood grain design applied and the beginning of the final coat. Almost there! Applying the darker overcoat for the finished product. Done! How ’bout them doors? 164 years old and never looking better! 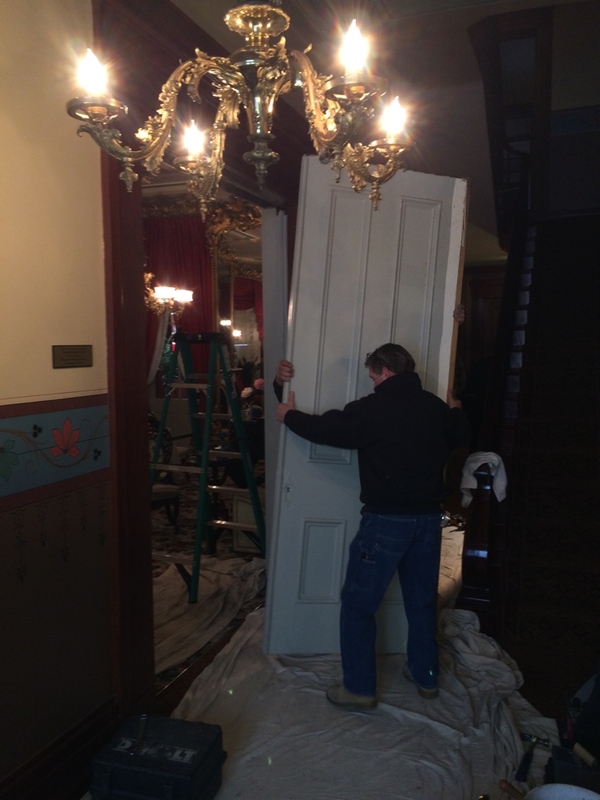 Parlor pocket doors being removed from the wall for the first time in more than 100 years. Watch out for the gasolier! Part of the door frame has to be removed in order to pull the doors out. With the doors out, our trusty craftsmen could determine what was causing the doors to jam. As it turns out, the problem wasn’t the doors themselves but piles of soot and debris that had built up inside the walls on either side. So here’s a picture of the inside of a wall at Campbell House. The lock and latch mechanism inside the doors. A simple design that still works perfectly 150+ years later. Lining the doors back up on the track and reinstalling them in the Parlor walls. Painter friend working to recreate a faux wood grain to match the rest of the hallway’s woodwork. Done and done! Another breathtaking restoration project at the Campbell House, and one that’s been on the “To Do” list for a long long time. Actually, more like a coat of paint. 2012 marks the 10-year anniversary of the completion of the exterior renovation of the house, and we’re due for another paint job. 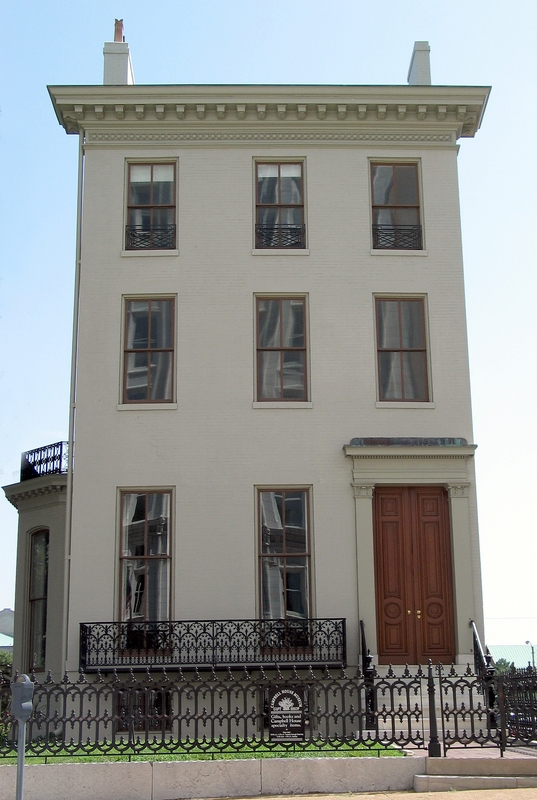 Fortunately, we’ve secured a generous grant from the Robert J. Trulaske, Jr. Family Foundation for the funds to have the brick, windows and cornices repainted. Since the house is so big and tall, this is going to be an exciting process because the painters will have to use a series of lifts to reach the highest points of the house. Work will likely begin this summer after we complete spot tuckpointing, and we’ll be sure to share pictures as the work progresses. Three cheers for the Robert J. Trulaske, Jr. Family Foundation for helping us keep the Campbells’ home in tip-top shape! Campbell House has a full complement of six interns this summer. Though most of them are from St. Louis, they represent universities from all over the country, (Vassar, Wartburg College and Washington University) and a variety of disciplines including art history, chemistry (really) and American culture studies. They’ll get the full museum experience this summer by giving tours, conducting research, inventorying the Campbell collection as well as all of the other day-to-day stuff that needs to get done (i.e. watering the garden, booking tours, working on membership renewals, etc). Check back in with us as we post intern profiles to the blog. These dynamic — and wickedly smart — students breathe new life into this house, and we’re fortunate to have their fresh perspective. While they’re learning the museum biz, we get new insight and ideas for making this old house current and relevant to a young demographic. Are you interested in joining us for an internship, too? Email Executive Director Andy Hahn at andy [at] campbellhousemuseum.org. This week, Intrepid Researcher Tom™ and our illustrious Executive Director Andy are taking a trip out to the wild west to visit Robert’s old stomping grounds. Beginning at Fort Laramie, the pair will meet Robert’s great-nephew Alan (who is coming all the way from Northern Ireland) to see the annual Rendezvous that reenacts the yearly event where trappers would meet with merchants to trade furs for goods. 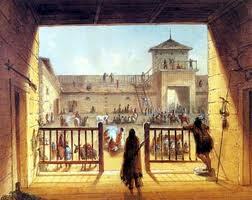 Fort Laramie is significant because Robert founded Fort William, which was Fort Laramie’s precursor. This year’s event will commemorate artist Alfred Jacob Miller’s 1837 trip to the rendezvous. Miller produced some of the most famous images of the Oregon Trail and Fort Laramie, including the one on the right. After the rendezvous, the trio will visit Museum of the Mountain Man, Pierre’s Hole (the site of the famous battle in which Robert and pal Bill Sublette played a major role), and finally — if they have time — a trip to Fort Bridger. We’ll be sure to post pictures after the travelers return. 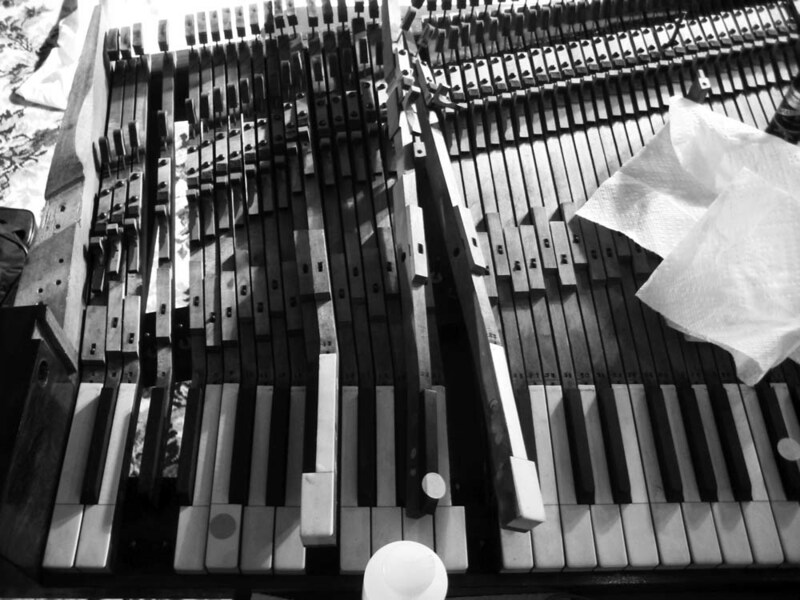 A picture from the process: the entire keyboard was removed from the body of the piano. In what proved to be a five-month project, the Campbells’ piano is DONE! JoAnn Kaplan of Kapstan Piano Services worked tirelessly to clean, fix and/or custom-fabricate new parts, and finally tune the old Schomacker. We didn’t do all that work for nothing — we’ll start hosting parlor concerts later this year. Check back for details. Did you miss our wildly successful Lucas Place/Tap Room walking tour last fall? Have no fear — we’ll offer it again and then some. This week we’re meeting with our friends at Landmarks Association of St. Louis to put together some fun and informative tours. As soon as we work out the details we ‘ll get a schedule of events posted. Do you have an idea for a building, neighborhood or special tour of Campbell House? Let us know! Send your bright idea to shelley.satke [at] gmail.com and we’ll see what we can do. 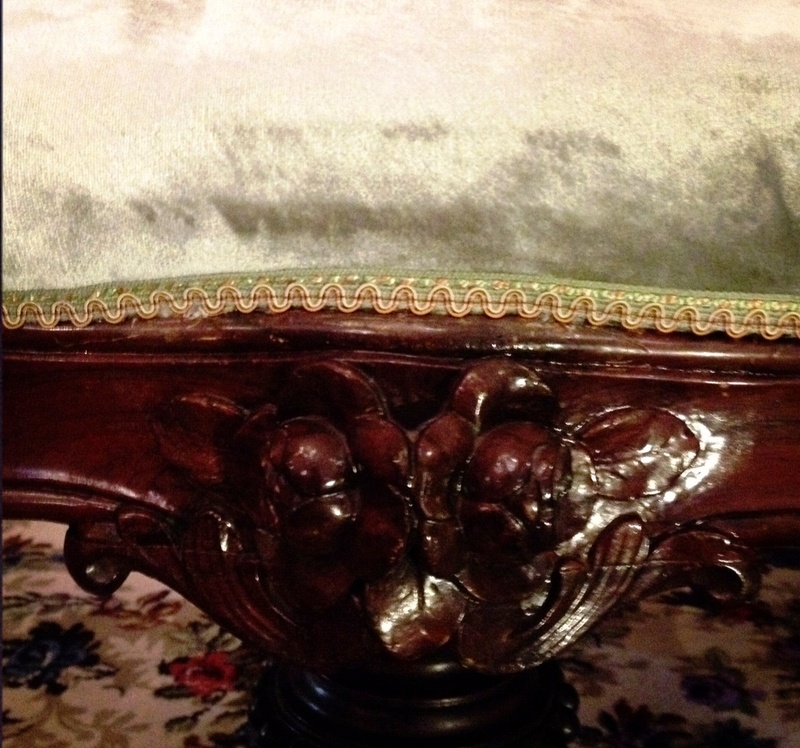 Detail of the reupholstered piano bench. That’s silk velvet and yes, it feels as good as it looks. The house is getting repainted, and two pieces of furniture have been reupholstered, too. The fabric on Virginia’s bidet cover had deteriorated to nothing more than threads, and the piano stool wasn’t in much better shape. Board member and interior designer Tim Rohan generously donated new fabric and had the tops of both pieces of furniture reupholstered over the existing fabrics so we would not lose the original material (what was left of it, anyway). Are you into urban treasure hunting? We have a new geocache in our garden….dig up your GPS or download a geocache app to find it, and add your name to the list! Board President Fritz Clifford with St. Louis Ballet dancers. 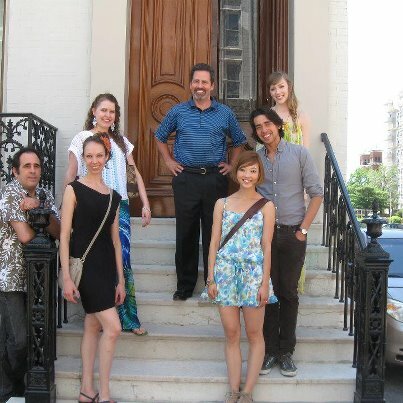 Last week we welcomed a crew of St. Louis Ballet dancers who performed at our Magical Spring Thing in April. They got the VIP tour with Andy and Board President Fritz leading the way. Do you have a special group that would like to have a special behind-the-scenes experience at Campbell House? Contact Andy (andy [at] campbellhousemuseum.org) or Shelley (shelley.satke [at] gmail.com) and we are more than happy to accommodate you! ….and that’s all the news that’s fit to print for now. Have a spectacular week!